It's been a week of change for Caster Semenya, the South African runner at the center of a gender controversy at last month's world track championships. First, one of her South African coaches quit the team in shame for not telling Semenya that she was being subjected to gender tests. 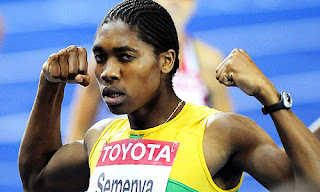 (Semenya had thought she was taking a doping test.) Then, Semenya appeared on the cover of South Africa's You magazine with a complete makeover designed to silence critics who insist she is a man. 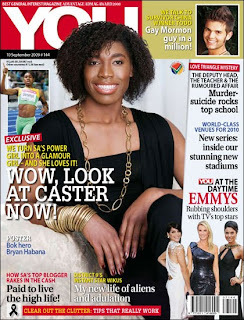 For the shoot Semenya sported a less ambiguous hair style, a designer black dress, jewelry, makeup and nail polish. Despite what you think about the whole situation, it's safe to say that this is the first time that Semenya has truly looked like an 18-year old woman.